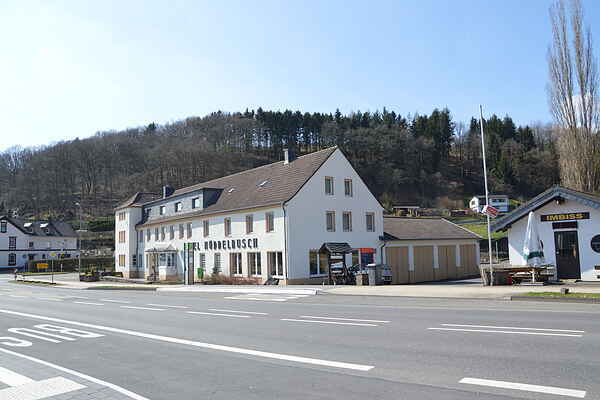 Looking for a big house for a weekend with family or friends in the Eifel with plenty of space for everyone? Then this group house is the right choice for you. This is a former hotel with several en suite bedrooms as well as a shower room in the hall for those rooms that don't have their own bathrooms. Do not expect a house of luxurious high quality the furnishings are dated, but this former hotel does have a lot to offer, including a bar with a parlour room, a large dining room, a professional kitchen and a recreational room with billiards and table football, as well as a TV room. There is more than enough space to park your car on the grounds. The surrounding area is certainly worth exploring as well. Schleiden is a nice and vibrant little village in the North Eifel, offering a selection of shops and restaurants. Eifel National Park is just 5 minutes away; this 110 km2 nature preserve has endless options for hiking, cycling and horseback riding. Wildpark Hellenthal is 5 minutes away and offers a big eagle show twice a day. Rohren sport centre is 15 minutes away, with a 1250-metre-long toboggan run in summer and skiing and snowboarding in winter. The Ruhrsee is 15 minutes away, offering many water sport activities and a variety of tours that you can take amid the beautiful mountains. The picturesque town of Monschau is 20 minutes away.